ViskoTeepak and TOMRA Sorting Food joined forces in order to develop a casing solution that would make it easier for hotdog producers to detect pieces of casing in peeling operations, while still being able to track the color formation of the sausage during processing. The result of this synergy is a completely new patent pending innovation in the world of casing and hotdog casing detection. This innovation can be used to produce skinless sausages of all types, including frankfurters, hotdogs, mini-salamis and much more. Combining TOMRA’s Genius optical sorter with ViskoTeepaks’ D-Tech development doesn’t only allow for casing detection but it is also possible to sort on size and other quality deviations such as color. 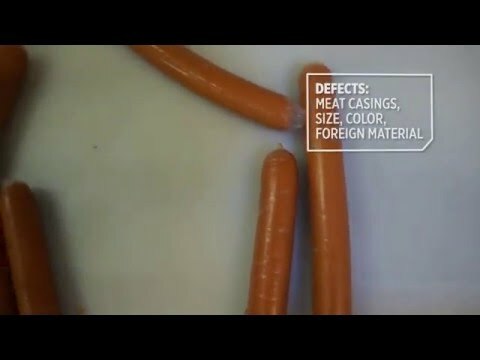 In the production of skinless sausages, it is essential to guarantee that all fragments of the casing are removed from the surface of the hotdogs after peeling. ViskoTeepak has therefore developed a special casing type, “Wienie-Pak D-Tech”, that allows producers to verify that the casings are completely removed. This type of casing contains a special component in the full body of the casing. This component leaves the casing fully transparent in normal conditions, but becomes detectable in combination with TOMRA’s Genius optical sorting machine. The innovation was thoroughly tested at a major German producer of salami snacks and the results were convincing. Shortly after, the customer decided to switch to D-Tech casing and TOMRA sorting technology. Read all about this new casing detection technology in our press release.